← Happy New Year.. you Pig ! While I’m still in the planning stages for this show at Rotofugi in Chicago this September here’s a teaser image for it. The basic thing behind this show deals with the current crop of vinyl makers and how they are all influenced ( directly or indirectly ) by Classic Bullmark and Marusan toys from Japan. It will be the first time a art show explores this connection plus show how US, Japanese and Global artists have taken those classic designs and morphed them into the current Kaiju Boom of toys. Whose involved ? Well you’ll have to wait till we get the web site up and running.. but let’s say it’s the cream of the crop where these types of toys are concerned !… with many more folks being added as we speak !!! You can bet there will be Exclusive,limited runs of vinyls, art work for sale and limited prints. Make your plans the show opens at Rotofugi’s gallery Sept 8th, 2007 ! 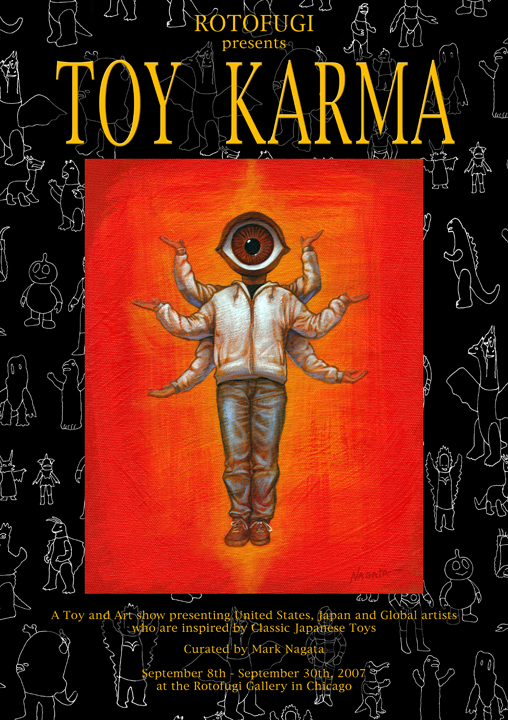 We’ll be posting more info here, on www.maxtoyco.com and soon to be up, www.toykarma.com !!! Ok back to work … oh ya, I should be re-opening the Max Toy Club in the next few weeks, sorry for the delay but I’ve had numerous art projects to finish plus the next Kaiju after Xam at the factory … phew… also have a crazy trip to Japan next month.. which with fingers crossed and much positive Toy Karma will yield a huge development for me as a collector and Max Toy’s 😉 .. but you’ll have to wait for more info !